Gold prices have been rallying. They are now at their highest level since July. And, this could be the beginning of a significant rally in gold prices. That can be seen on the chart of SPDR Gold Trust (NYSE: GLD) shown below. This ETF makes gold easily accessible to individual investors. Right now, it could be worth considering as a buy. It’s widely believed that gold prices have historically gone higher in times of crisis. That has often been true. Gold serves as a safe haven investment and could be particularly appealing right now as a number of geopolitical crises threaten, the Federal Reserve could be reversing policy, and the stock market could be declining. It’s one of those times when it is impossible to completely list all of the global hotspots. Brexit could roil Europe as the European Union struggles with an Italian budget and France faces rioting. All of this is occurring as the European central Bank is expected to reverse its policies early next year. As it almost always is, the Middle East is a cause for concern. Saudi Arabia, Yemen and Iran are just three countries which could create negative and market moving headlines. This is often a cause for gold to rally. But, there are other metals that could provide gains to investors. “In the near-term, palladium’s superior supply-demand backdrop could see it surpass gold,” analysts at precious metals consulting firm Metals Focus wrote in a recent research note. Global automotive demand for palladium, meanwhile, despite weak recent sales of light vehicles in China and the U.S., may “achieve a new record high in 2018 of around 8.5 [million ounces],” the analysts said. The metal is widely used in the pollution-control catalytic converters on gasoline-powered vehicles. 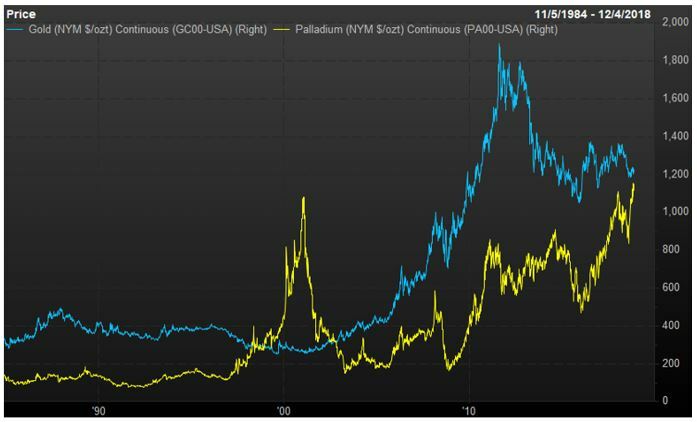 This means the price of palladium is rising and could move above gold. That was how the relationship looks for a time earlier this century. The market has also seen a rise in platinum group metals “loadings to meet tighter emissions standards,” Metals Focus analysts said. Platinum is palladium’s sister metal, is more commonly used in catalytic converters for diesel engines, but in 2015, Volkswagen VOW admitted to manipulating emissions tests on some diesel-power vehicles in the U.S. and elsewhere. Looking further ahead, however, gold may re-establish its premium over palladium, the Metals Focus analysts said. Traders in the futures markets have easy access to these metals. Individuals could also consider the Aberdeen Standard Phys Palladium Shares ETF (NYSE: PALL), an exchange traded fund with more than $140 million in assets, or Aberdeen Standard Phys Platinum Shares ETF (NYSE: PPLT) which has more than $500 million in assets. Assets under management is an important consideration for an ETF. That is because smaller funds could be closed because they are not profitable to their sponsors. There is no answer to the question of what the correct minimum amount of assets is. It varies by sponsors and comfort level of individual investors. If gold rallies, it is likely that silver will move higher as well. In this market, the individual investor has a number of investment options. Given the relatively low price of an ounce of silver, it is possible to simply buy the metal in the form of bullion or coins. This can be expensive and it is important to research dealers to ensure that you are buying from a reputable source. One advantage of this approach is that silver coins or bullion in the form of bars or ingots is relatively easy to sell. One disadvantage is that spread between the buy and sell prices can be large and it can be expensive to own silver in this way, especially in the short term. The cheapest way to invest in silver could be with futures contracts but this investment carries significant risks and will not be the right choice for many investors. There are also silver ETFs including the iShares Silver Trust (NYSE: SLV). But you can also invest in silver through mining companies. Shares of miners will generally track the general trend of silver prices, but miners also offer some degree of leverage. An example might be the best way to explain the leverage miners offer. This is a simplified example so we will assume the company has no other costs and no additional revenue. The actual model would be much more complex. If the price of silver increases by 10%, to $11.11 an ounce, assuming the costs of production stayed the same, the miner’s profits would increase to $1.11 an ounce or $1.11 million for the company, an increase of 11%. The miner is leveraged and benefits immensely from higher silver prices. Remember, there is no free lunch in the stock market. Leverage can help increase investment returns on the upside but can cause significant losses on the downside. A 10% decline in the price of silver could result in an 11% drop in earnings for this miner. This leverage makes silver miners an excellent way to invest in silver. The same is true for gold. Buying miners when metal prices are low can lead to large gains when the price of the metal recovers. Now is an ideal time to consider adding miners to your portfolio.